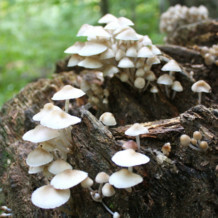 Home » Events » 10-13-2018 Falling for Fungi! Join certified arborist Mike Rolli for a walk through the autumn woods in Glen Providence Park! Those who attended Mike’s previous walks know the remarkable depth and breadth of his knowledge of our local trees and plants, and the fascinating details he shares. He has worked on an extensive botanical survey of the species to be found in the glen. This time he’ll be focusing on fungi, and other Fall finds! Be prepared for steep hills, and uneven (possibly wet) terrain: wear your hiking shoes, and bring a hiking pole if you use one. Binoculars and nature guides encouraged. * Updated on Friday, October 12: The forecast calls for some rain overnight, but it should stop by 10:00am, and Mike will lead the walk on Saturday – rain or shine! Hello everybody, George here. I was walking about the Glen and noticed more people enjoying the woods. To my surprise you guys had an outing. Falling for Fungi. I am glad I caught the ending and a wonderful greeting too. Some amazing sites I love to visit are: Learn Your Land has an amazing youtube channel, https://www.youtube.com/channel/UCcbf8wnyVJl631LAmAbo7nw . I hike as often as possible for health reasons. See you guys around It was fun to meet up with the group. Geo. It was great to meet you! Thank you for the link. We hope to see you again in the park – perhaps you can join us on one of our monthly walks!